A unique venue situated on 360 acres of woodlands, meadows, and the beautiful winding Turtle Creek. We offer a full service event package for weddings, graduations, anniversaries and other special events including food (from our caterer), and many beer and wine options from our indoor-outdoor bar, The Green Turtle Tavern. Our main lodge can seat 165 people and we offer covered seating under a 40’x60′ tent top for 300+ outdoors. We have modern audio/visual capabilities as well as handicap accessible bathrooms. In addition, our Bell Tower provides a grand covered area for outdoor buffet serving and our brides cottage provides a rustic changing and resting area for the party with separate quarters for the guys. Guests may busy themselves by hiking along the creek and catching crayfish or meandering on the hillside that overlooks the facility with literally miles of trails. Tractor and wagon rides are available for those who would prefer to ride. Regulation horseshoe pits, and bean bag games are offered as well. Our full service staff welcomes you to come for a visit and see in person all that we have to offer! 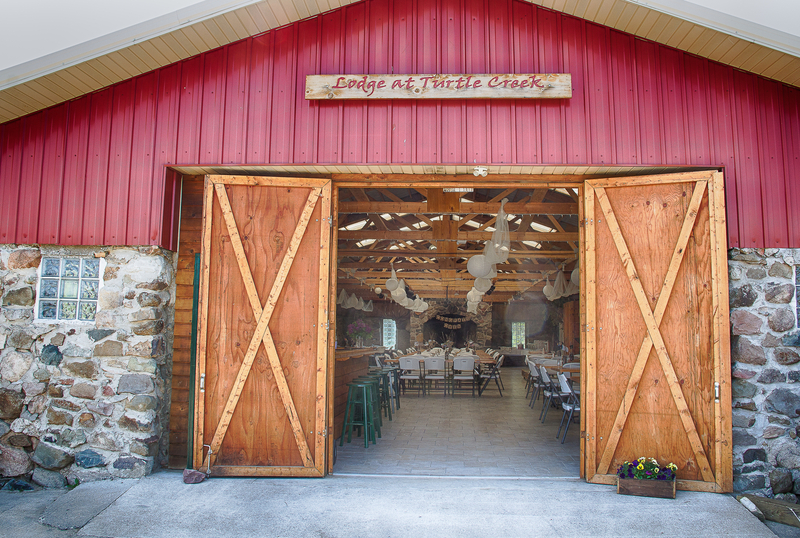 Turtle Creek Glen is a beautiful event venue that was built with you in mind. At Turtle Creek Glen, we understand that every couple has their own style, budget and vision for their wedding. We provide all of the event essentials for your special day as well as the flexibility and tools to make the wedding of your dreams a reality. We have a variety of spaces for your ceremony and reception as well as a Bride’s Room and Groom’s Room to make your day memorable. Our friendly, quiet environment, variety of room options, and onsite catering make Turtle Creek Glen the ideal location for your next corporate event or training session. We guarantee that our open-vendor policy, top-notch customer service and focus on time-saving flexibility will create a refreshingly simple event experience. Let Turtle Creek Glen handle all of the details so you can focus on what is truly important, your business. You’ll find infinite décor options, versatile event spaces and all of your event essentials at Turtle Creek Glen. Whether you’re planning a birthday party, graduation, retirement party, or any other special occasion, our event venue will host all your needs. Our friendly staff will help you customize the space to fit your style with multiple linen colors, sound system, video projector and décor options. We can’t wait to celebrate with you soon!